Each month sends a certain vibe through the air. Allow us to introduce you the soundtrack to match it. #HBSummerShare is back, and we’re ready for you to take on the challenge! It’s easy to get caught up in the patio weather, sangria pitchers, and fro-yo, but we can’t forget to get our sweat on through the season. 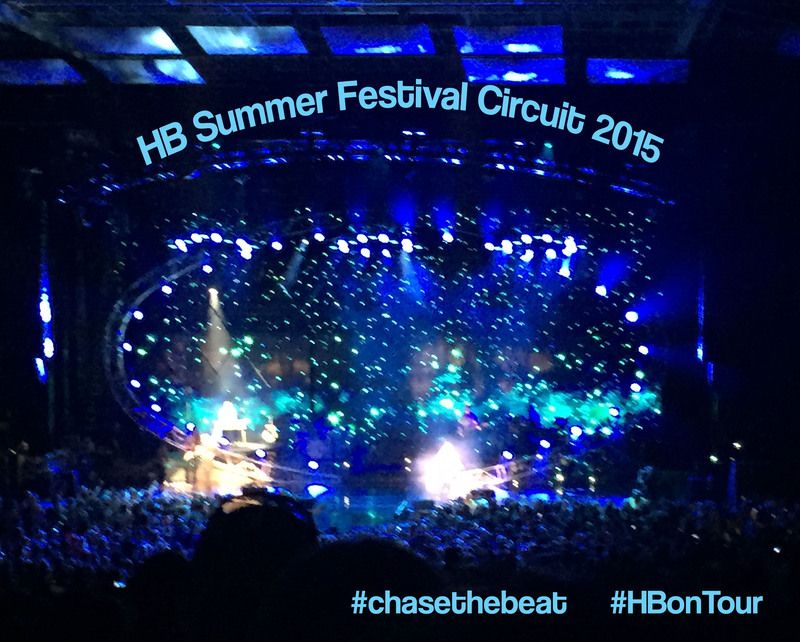 #HBSummerShare Finale! Congrats to All! 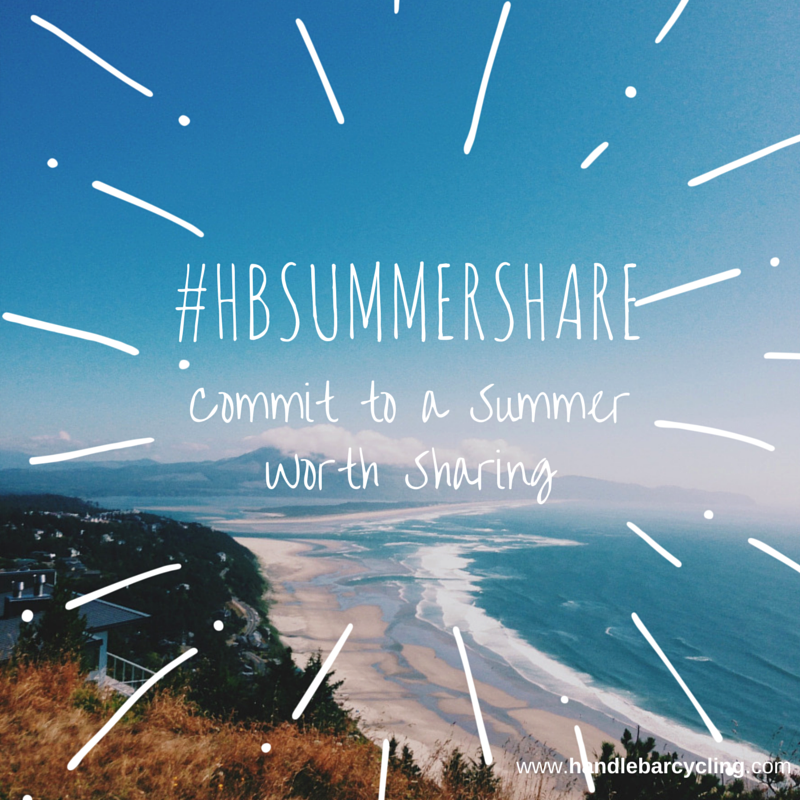 We hope all of your enjoy every minute of #HBSummerShare, we definitely did. Hopefully it has inspired you to challenge yourself and others to not only ride more but enjoy life as well. 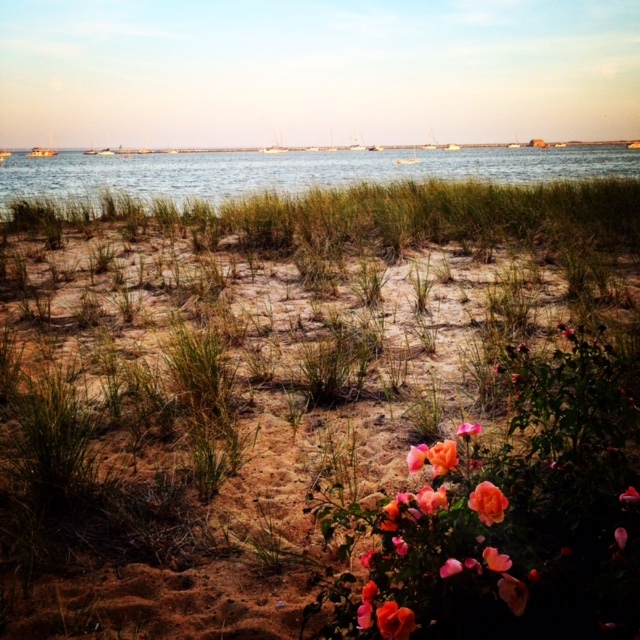 We want to thank you for sharing your summers with us! You have #RAISEDTHEBAR! Jess will be emailing all riders that rode 45 or more rides during the 10 weeks so you can pick up your #HBSummerShare towel. And now for the big reveal of the riders with the more rides! The top three riders are…..
Not only do these three riders win a #HBSummerShare towel but the Grand Prize Winner, Caitlyn Kerrigan, has won a complimentary unlimited month of free riding. The two runner up winners, Jaclyn Johnson and Katelyn Cunniff, have both won an entire week of unlimited riding. Congrats ladies! Remember to ride every day like its Summer Share! Stay active, keep challenging yourself and take yourselves to new heights. You created and successfully committed to a summer with sharing. 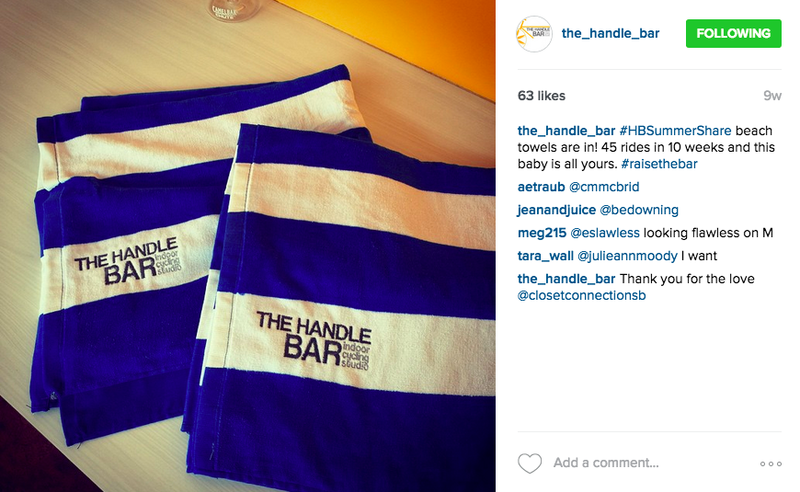 Tweet us your favorite moments of this summers #HBSummerShare @the_handle_bar! #HBSummerShare is BACK and we’re ready for you to take on the challenge! It’s easy to get caught up in the patio weather, sangria pitchers, and fro-yo, but we can’t forget to get our sweat on through the season. We created #HBSummerShare last spring in an effort to keep our dedicated winter riders going strong as New Years resolutions begin to pitter out. The Summer Share is a combination of a discounted 10 weeks of riding and a little friendly competition to keep everyone on track. Along the way, we want to see how you spend your summer – so be sure to share your fantastic summer journeys with us on social media and get rewarded. (Reward deets to follow). There is a slight difference between this summer and last summer’s challenge. The hashtag and riding will be kept separate this year. So there are technically TWO challenges. WooHooo! 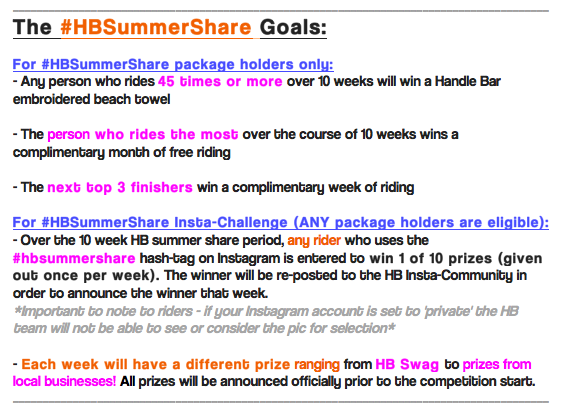 Anyone in the HB Community can participate in the hashtag challenge, not just the riders that have purchased the #HBSummerShare package. 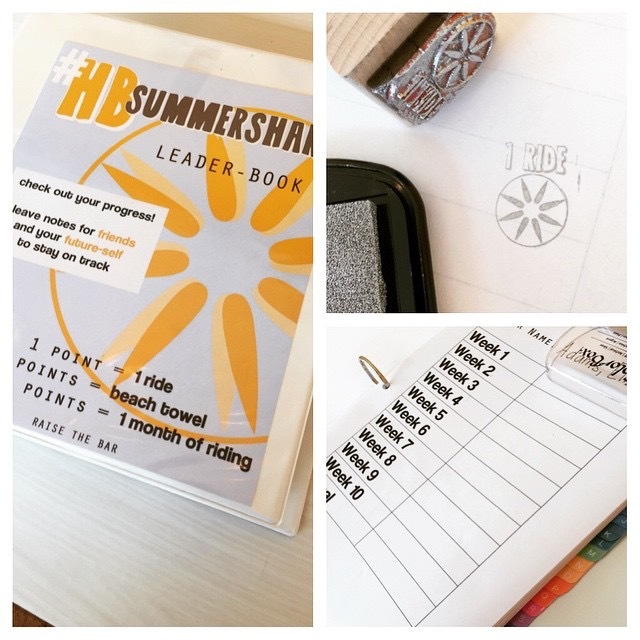 The HB riding competition is for #HBSummerShare package holders only and results will be recorded on the wall of each studio on our traditional #HBSummerShare leaderboard (see below). 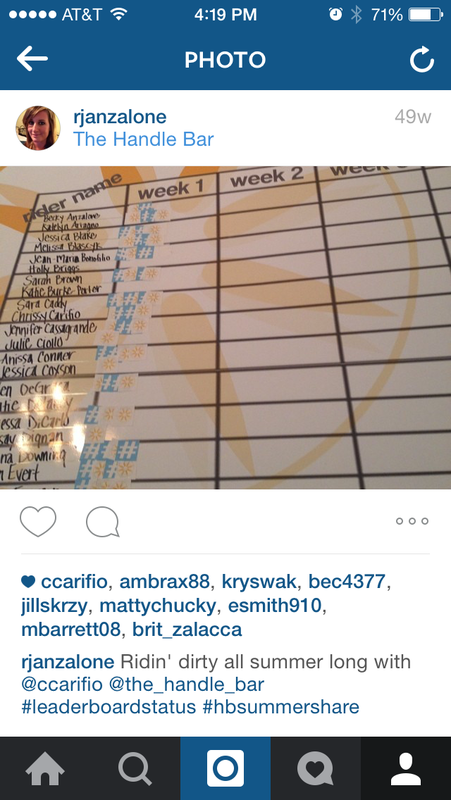 Throughout the summer, the HB staff will keep track of each rider’s number of rides on an in-studio leader board. 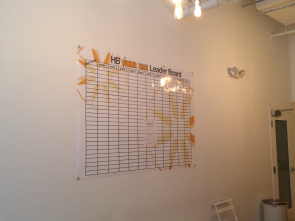 The LeaderBoard will be posted in each studio for riders to keep track of the #HBSummerShare progress! For the HB Instagram challenge, we’re rewarding ANYONE who uses the hashtag #HBSummerShare on Instagram and twitter.. not just our summershare riders. The more you use it, the greater your chance at winning. Get creative, try to inspire your community! Each week we’ll pic a favorite post or pic and treat that rider to a surprise prize, a different theme each week 🙂 Think swag, gift cards, tickets, to all of your favorite (and our favorite) places. So ALL riders should hashtag-it-up all summer long to get on our radar and win 1 of 10 awesome prizes along the way. Are you ready? Packages are available to purchase NOW… An AMAZING 10 weeks of riding for just $400! And if you buy before May 15th, early bird price is $375! Once the #HBSummerShare kicks off on June 1st, we’ll be following your progress riding AND sharing your Instagrams/tweets to keep you motivated and on track all summer long! Note: Of course, participation in the challenge is NOT required. You can take advantage of the unlimited discount and enjoy the package without participating in the leader board… just shoot us an email after your purchase and we’ll be sure to keep your attendance private. Get Ready… Get Excited….AND RAISE THAT BAR!